I believe in outfit formulae– the kind where you have a set combination of clothing to go to, that work perfectly for your event. I’m also a huge believer in repeating your clothing. I think it’s unreasonable to expect to dress completely new every single occasion. But sometimes, you look at your wardrobe and think, “I’ve worn this before, how can I wear it again?”. 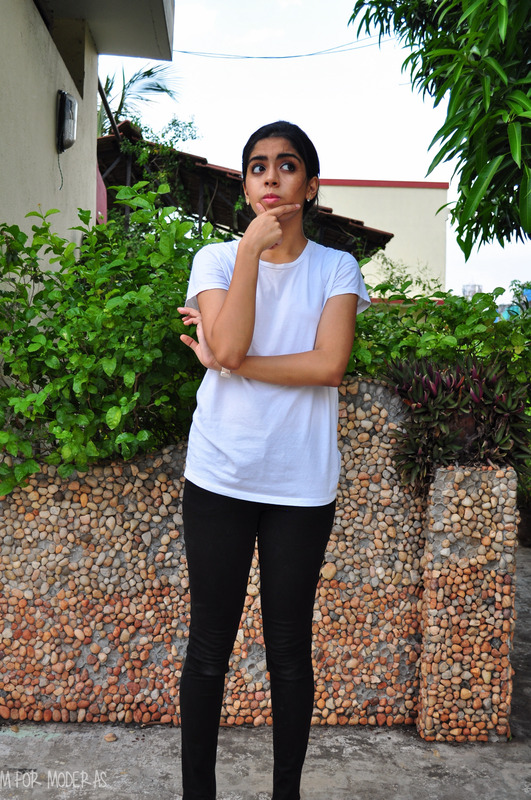 And so, today I will walk you through two radically different ways to wear the same outfit base– a white tee + black pants. I chose these because they were classics that almost all of us have in our wardrobes, but usually don’t think of multitasking. And this is the best place to start. 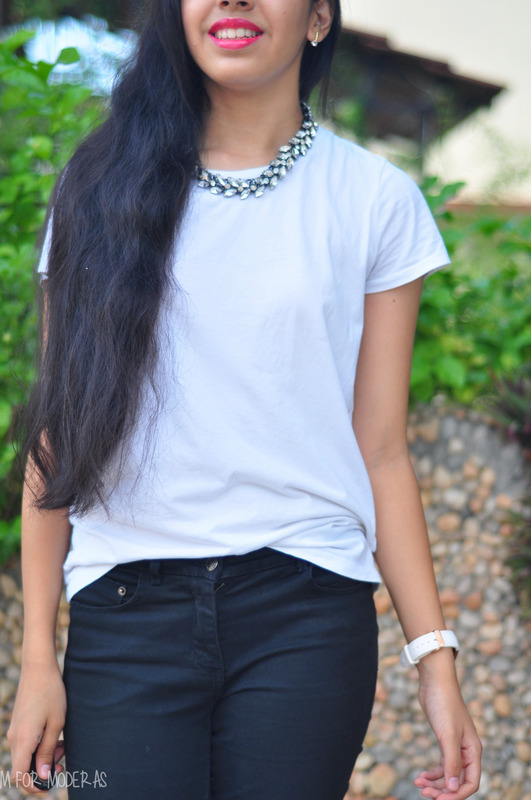 The same tee + trouser combination can look like a whole new outfit, depending on how you style it. And if you are worried about repeating, trust me, no one will even notice you’re wearing the same thing! 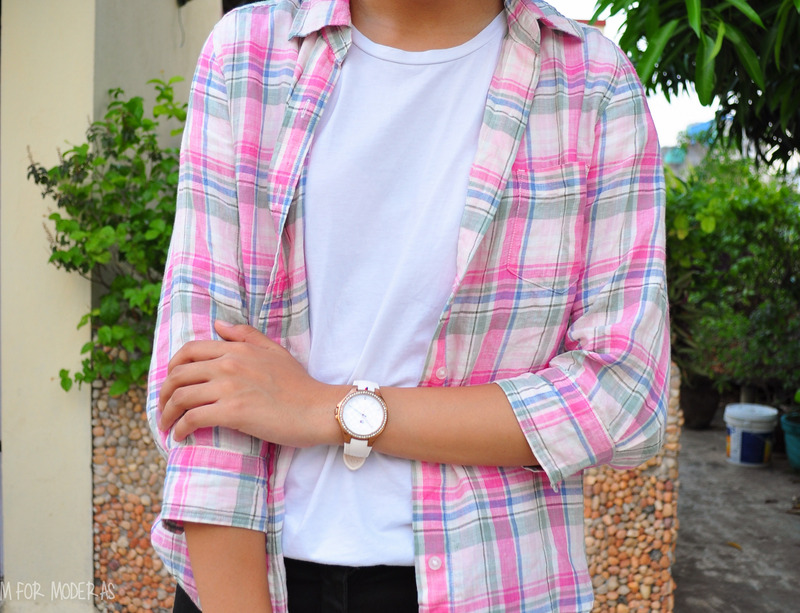 A plaid shirt worn over a white tee adds some interest + dimension to an otherwise standard outfit. 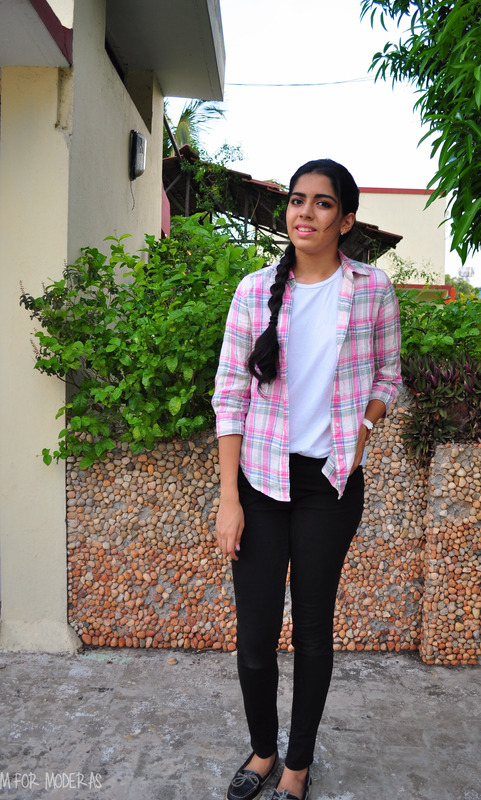 Unbuttoned completely, the shirt functions more like a jacket, but without the added heaviness/layer– which is the most important because who can wear a jacket in Chennai now anyway? 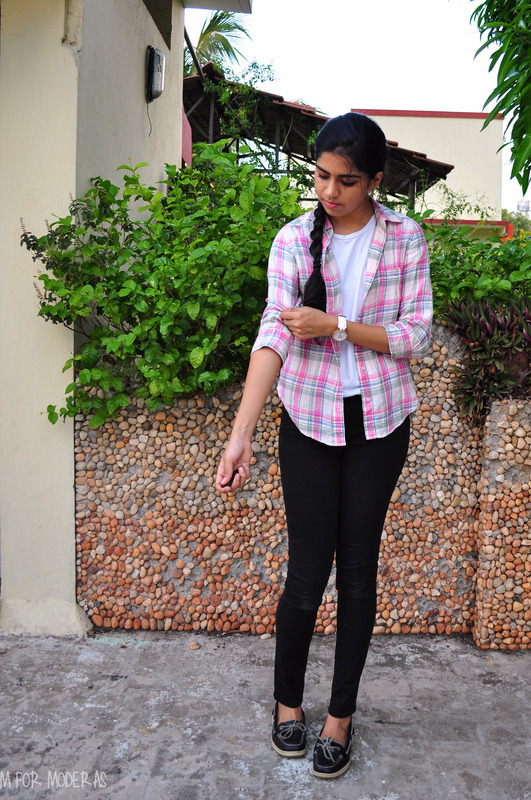 Regular accessorising makes this perfect for everyday– braid, watch, and boat shoes. This would work great with any low-top sneaker as well. The tee is uniformly folded under itself at its end to reduce the length a little. This gives a cleaner effect to the layering + adds visual interest with different lengths of shirt/tee. Fun fact, this plaid pattern is known as a Madras check. It made its way to international markets through Brooks Brothers in 1902, but remains firmly Madras in its roots and origins. In some way, the print lives on, even though the demand for the traditional technique of printing this pattern has waned. 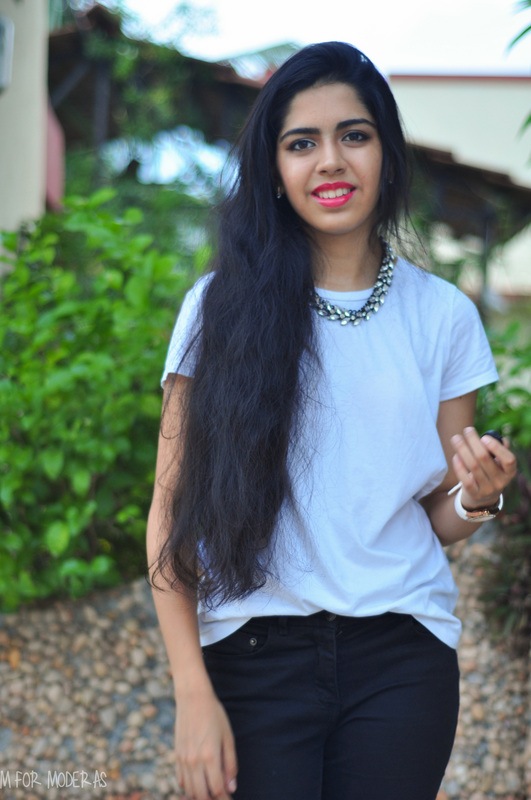 I think this is a fun outfit for a day with friends & perfect for casual catch-up sessions. It’s polished enough to say you’ve made an effort, but doesn’t scream “carefully-curated”, hence lending it the relaxed vibe. 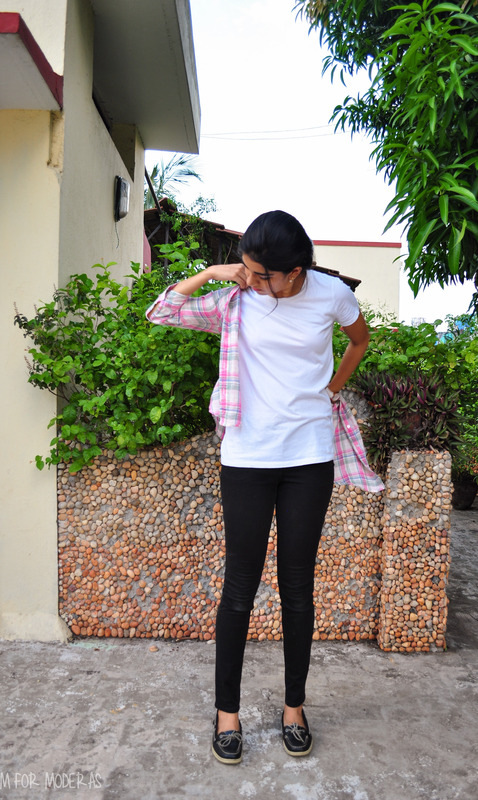 #1: Wearing Uniqlo shirt & Sperry’s Top Sider boat shoes. The amount a pair of heels + red lips impact your outfit: Exhibit A. 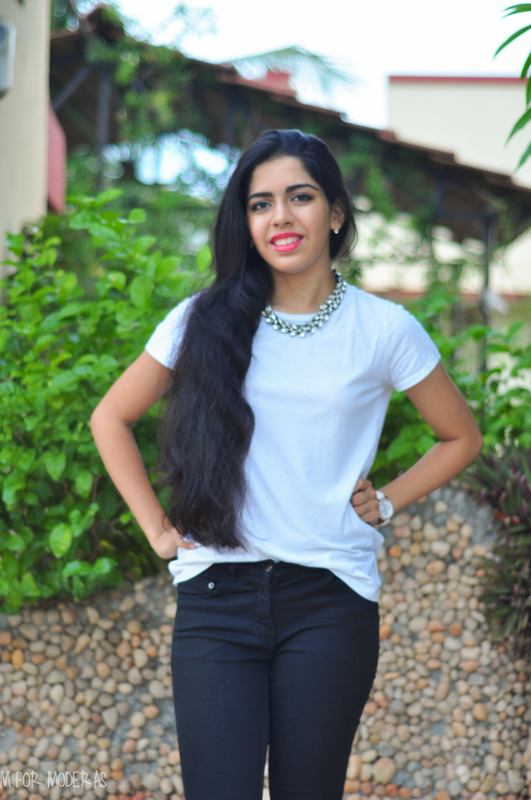 This necklace is shiny, sparkling and perfect against a white t-shirt. I recommend using white/rhinestone short necklaces for this outfit, because gold/silver/coloured tones might alter the look. It will work, but might require a bracelet/different shoes to tie it in. These heels are low enough for comfort, but can easily be swapped for pointed black flats & give the same effect. 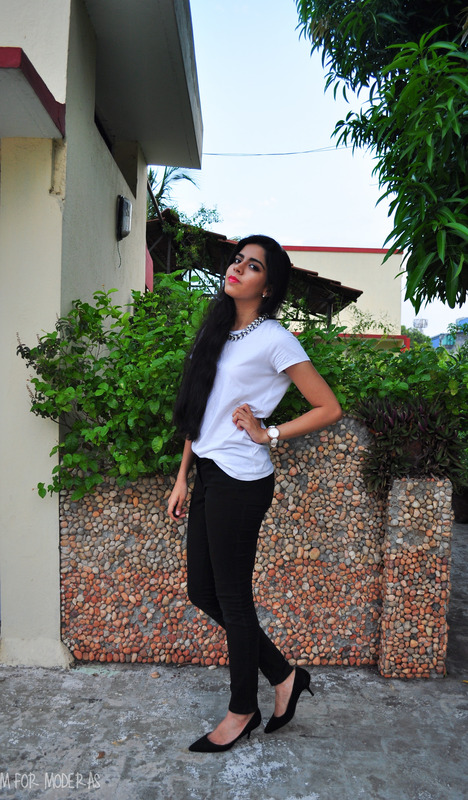 making you look effortlessly cool in 5 seconds flat. This outfit is made for your fancy nights out and the party or two. I guarantee compliments, but I also will attest to comfort. It’s just a white tee and pants. No fussy dresses and skirts in the picture. #2: Wearing Forever 21 necklace, Zara heels, and Revlon lipgloss in Fire. More importantly, take a look at the two outfits. 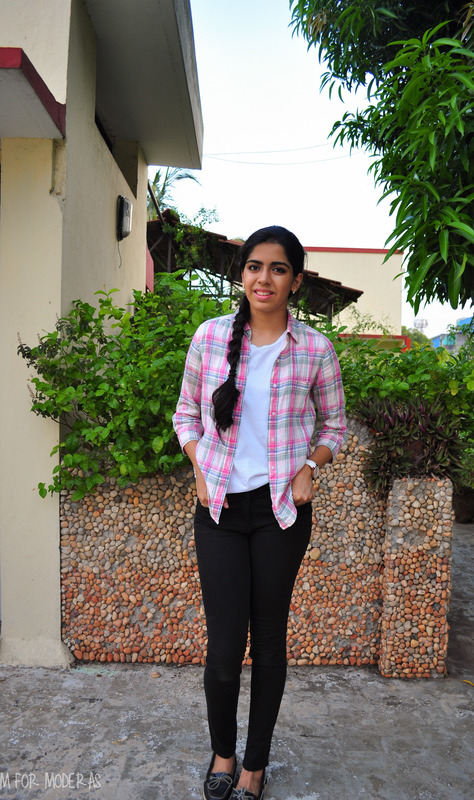 I am wearing the EXACT same base, but with some simple styling, you’ve got two outfits that look so different. It goes to show how just much an accessory or two can make a difference. I hope you liked this post! 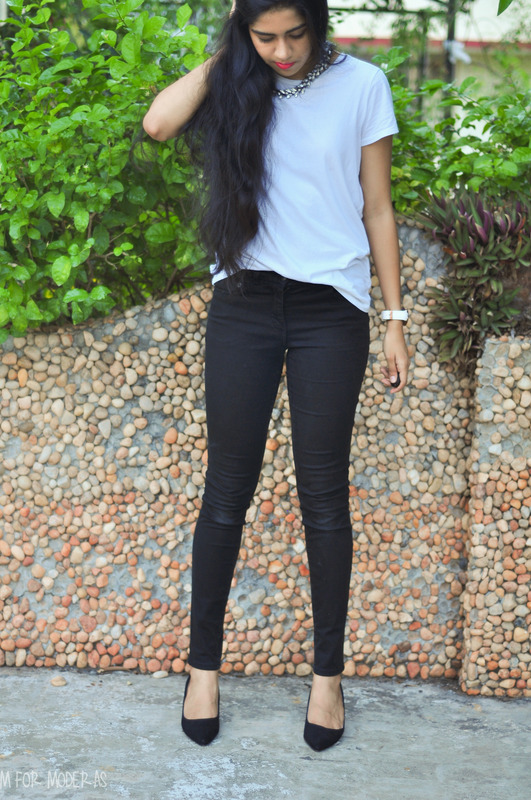 How do you wear your white tee + black pants? Tell me in the comments! So clarify for me, is your necklace from Rhinestone or Forever21? Hi Varsha! My name is Nethra. You probably don’t know me, but we were both delegates at the CV MUN a couple of years ago. 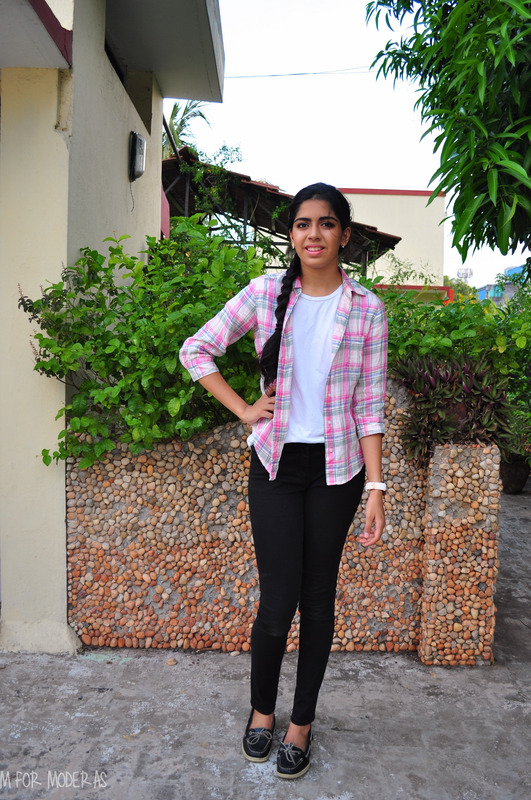 You were the delegate of U.S.A, I think, and you were absolutely amazing! I just started blogging and stumbled across your site. I really love the content and your sense of fashion! You seem to be really good at this 🙂 I was wondering if you could give me a few tips about blogging in general or what to do when you start. I would really appreciate it! Yes, I was U.S.A, one of my better moments, hehe.